Frederick Winthrop Faxon was born in Roxbury MA on August 24, 1866 to Marcus and Augusta Chalmers (Fernald) Faxon. In his life, he was a writer, editor, publisher, bibliographer, avid photographer, and lifelong champion of libraries. Fred Faxon graduated high school from the Boston Latin School in 1885. He became the permanent class secretary in 1888 and continued to fill that role for their class reunions for several decades. He graduated with a B.A. from Harvard University in 1889. He immediately went to work for the Boston Book Company, originally a publisher of law books, in their newly formed Library Department. In 1902, he became the department manager. 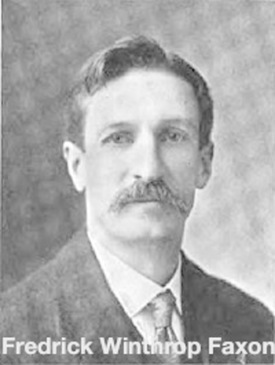 In 1911, he was promoted to director of the company. In 1913, he was appointed president and treasurer. In 1918 (or possibly 1915), he bought the business and changed its name to the F.W. Faxon Company. The focus of his company now was regularly updated reference periodicals about the American magazine industry. Throughout his career, both at the Boston Book Co., and F.W. 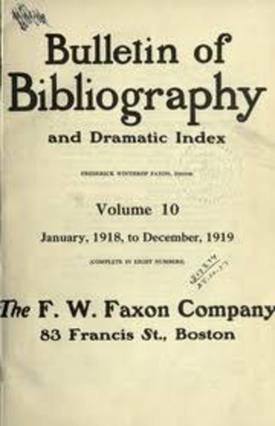 Faxon Co., Fred Faxon compiled and/or edited, and published many periodicals and single publications that were extremely important in the library world of the time. These include: Bulletin of Bibliography, Literary Annuals and Gift-Books, Ephemeral Bibelots, Dramatic Index, Annual Magazine Subject-Index, and many others, "distinguishing himself as an historian of American magazines." (Dictionary of American Library Biography, 1978) In fact, the name "Faxon" remains well-known in library circles, even after the F.W. Faxon Co. finally closed in 2007, 71 years after its founder's death. When he was 34 years old, Fred Faxon married Adeline True Thompson at the Church of the New Jerusalem in Boston MA on May 16, 1900. Throughout their life, they lived in various neighborhoods in Boston MA including Dorchester, Jamaica Plain, and Roslindale. Adeline Faxon died in 1929 when Fred Faxon was 63 years old. Although he was was not a librarian, he devoted himself to serving librarians and promoting libraries for most of four decades. He was especially involved with the American Library Association (ALA), serving as Travel Secretary (1896-1900), Secretary (1900-1902), and © F.W. Faxon 1918Chairman of the Travel Committee (1902-1934). He served on the Local Planning Committe for the 1902 ALA Conference in Boston, as well as being an official delegate to the Library Association of Great Britain meeting in Liverpool in 1912. Besides the ALA, Fred Faxon was a also a member of the Massachusetts Library Club (president 1931-1932), Rhode Island Library Association, New York State Library Association, New Jersey Library Association, Pennsylvania Library Club, Michigan Library Association, Wisconsin Library Association, Special Libraries Association, Bibliographic Society of America (treasurer), Appalachian Mountain Club, the Harvard Club, and was listed in most editions of Who's Who in America from 1901-1920. In the compilation of the Magazine Subject Index and the editing of the subsequent annual continuing volumes, in the editing, and doing a good part of the compilation of the Dramatic Index, 1909 to date, I consider I have been the means of helping many library searchers to needed information. Both these indexes were originated by me. My travels have taken me into all the States of my country and to Alaska; also twice abroad. I feel this opportunity to travel has been of great help to me in its broadening effects. He was, in fact, a world traveler, not only visiting all the states in the Union (and Alaska! ), but on two separated trips abroad, also spent time in London, France, Belgium, Germany, Holland, Switzerland, Ireland, Scotland, and Wales. Faxon has been described as a man who exemplified service without officiousness, who radiated good will, who brought to every activity poise and stability, to every enterprise a wise intelligence. He was highly respected and honored by his staff. He has also been described as a "man who possessed a rare sense of humor and sharp wit, which he could use with telling effect to enliven long or tedious business sessions, yet never so as to cause hurt." Throughout his life, Fred Faxon was an avid photographer, taking photos nearly everywhere he went. In the library world, he attended 43 ALA conferences, extensively photographing all of them, making small, pocket-size "traveling conference photo albums" which he circulated among his librarian friends "round robin" style. Several of these are in the ALA archives. 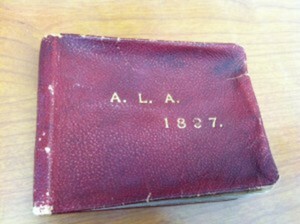 The ALA's "F.W. Faxon Photographs Collection" contains 598 of his photos, primarily of librarians in various activities at the ALA's yearly conventions from 1894-1932. 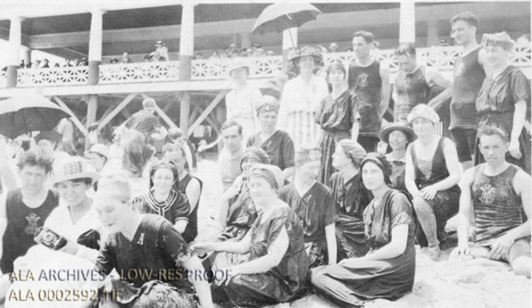 "Librarians from the New York Public Library and other libraries at the beach at Asbury Park, New Jersey, during the 1916 ALA Annual Conference." 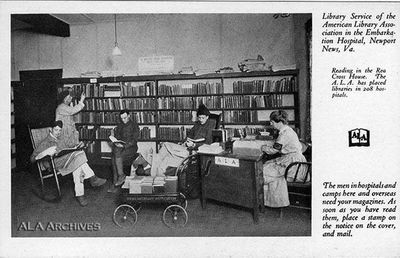 Fred Faxon's personal "library postcard" collection (many addressed to himself) forms a core part of the ALA's "Library Building Photographs Collection" of photographic papers and postcards containing paintings, drawings, and photos of public, academic, and government libraries. Fred Faxon was also active in the Church, attending the Boston Church of the New Jerusalem. As a young man, he participated in the national New-Church League, serving on the Committee on Lantern Slides (a fairly large lending library of slides available to be shown at local League meetings) at least from 1910-1912. Later in life, he served on the board of trustees of the New Church Theological School. The program for the evening consisted of stereopticon pictures of the national parks by Frederick Faxon of the Boston New Church, showing pictures of his personal visits to the Grand Canyon, Yellowstone Park and Mt. Rainier, which included some of his movie camera films. It is as yet unknown when he first attended the Assembly, but he was a steady presence for many, many years. 1935, however, was his last year. ...during the sojourn there were lantern talks [ed. note: narrated slideshows] by Mr. F.W. Faxon, one on the White Mountains, with an added "movie" of the last Boston Society picnic at Nantasket Beach, the other a movie account of his last visit to Yellowstone, with slides of other national parks and of Panama and Costa Rica added. Note: A movie film of two reels, part in color, taking thirty minutes, showing all the activities of the 1935 Assembly—lectures, ministers, attendants, classes, sports, and the buildings and scenery—will be available after October 15th for advertising the Assembly. A 16 mm. projector is necessary. Apply for dates to F. W. Faxon, Roslindale, Massachusetts. 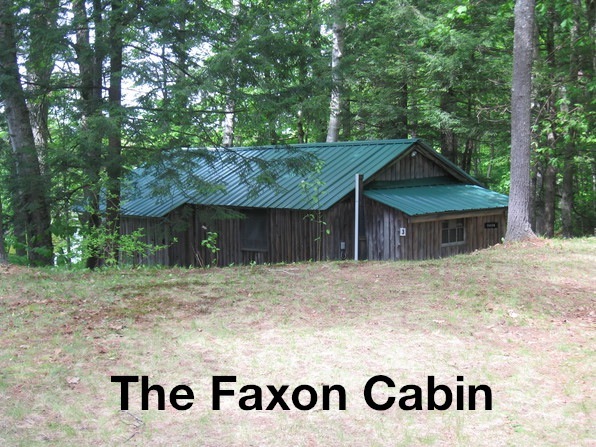 In early 1936, at age 69, he had the Faxon Cabin built, but suddenly became seriously ill just before the session began. After a brief illness, he died on August 31, 1936, just a week after his 70th birthday and the day after the session ended, never having used the cabin which bears his name.